You can now give someone the gift of music and introduce them to what we – and others – believe to be some of the best choral courses money can buy. Let others into the secret and introduce them to an English Choral Experience. 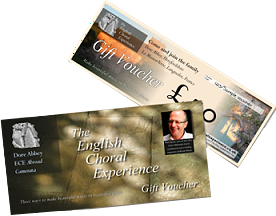 Gift vouchers can be bought in multiples of £25* and can be used against any of our courses, now or in the future, and can be sent either directly to the recipient or to the purchaser. * Please note that an administration charge of £2 is made per gift.